The recent Mail on Sunday article by David Rose showing essentially no global warming for the the last 16 years has caused quite a stir. The data he used for the article are the Met Office/UEA own dataset – Hadcrut4. The Met Office response to this is available on their news media blog . Notwithstanding various objections they essentially have to agree that David Rose’s article is correct and that there has indeed been no warming. 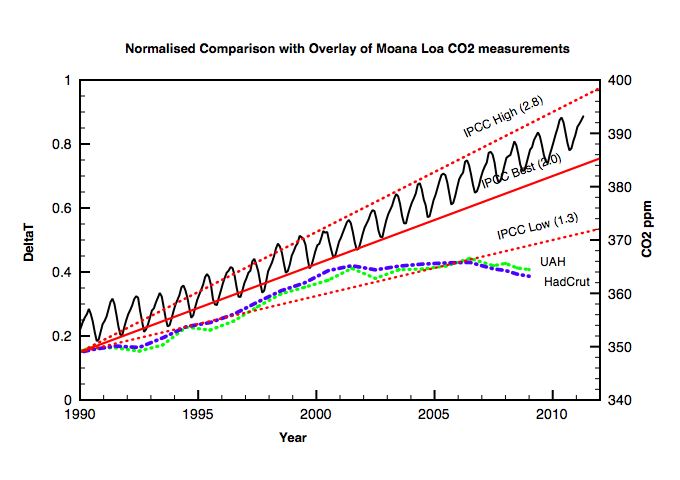 However they are sticking to their model predictions of 0.2 degrees/decade, although admitting that natural variations are not well understood. In other words if we wait long enough warming will surely restart with a bang. I was recently at a presentation by the Met Office CEO John Hirst. 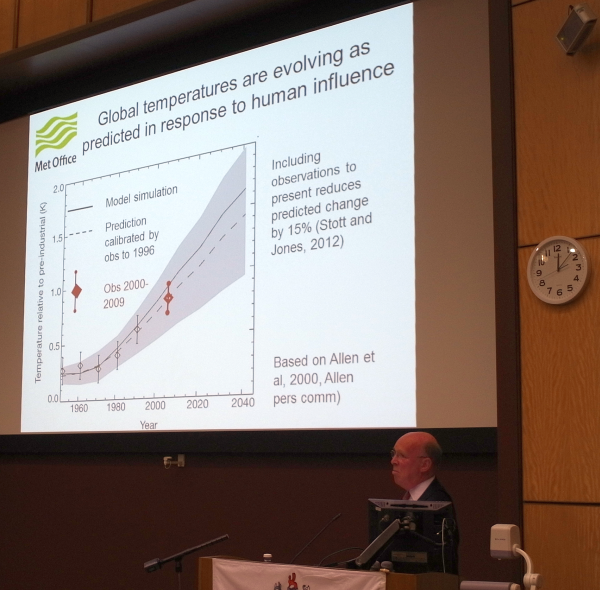 He showed a slide “Global temperatures are evolving as predicted in response to Human influence”. You can see a photo of that slide here. I was interested in tracking down the slide and recalculating the data up to 2012. Updated Met Office slide showing in blue temperature data up to September 2012. Points are decadel averages centred on 1951, 1961 etc. The red point was the Met Office update 1999-2009. The original points are in black. I found the slide in a presentation by Matt Collins of Exeter University. I used the latest Hadcrut3 data and made decadel averages centered on 1951, 1961 etc as ascertained from their plot. I then carefully overlaid the points onto the slide. My points are shown in Blue and overlap well but not quite exactly with the Hadley points (I suspect they are using slightly different start dates). My two new points are those for 2001 and 2011 ( 7 year average). Their 3 year old update is shown in red. The model has already been re-callibrated to fit the data (dashed curve). Note how the plot expands the errors to cover low options. The grey area includes the overlap of both the original and the re-calibrated predictions. The flattening of temperature is clear but it looks like they are safe for another 10 years if they do a bit more recalibration. If temperatures continue to remain flat then probably egg will need to be wiped from faces. This entry was posted in AGW, Climate Change, climate science, Science and tagged Climate Change, Met Office, Models. Bookmark the permalink. Interesting data. It seems like the global warming is breaking slowly. I read articles where it was shown that on Mars the temperature was also rising last decades. Is there any available data presenting the last measurements from the red planet? Maybe we have there similar mechanism and sun plays the most important role on it? Or its just opposite ( the human induced changes have bigger impact on the average temperature, and the sun activity is not the key point)? Next results will be very interesting. 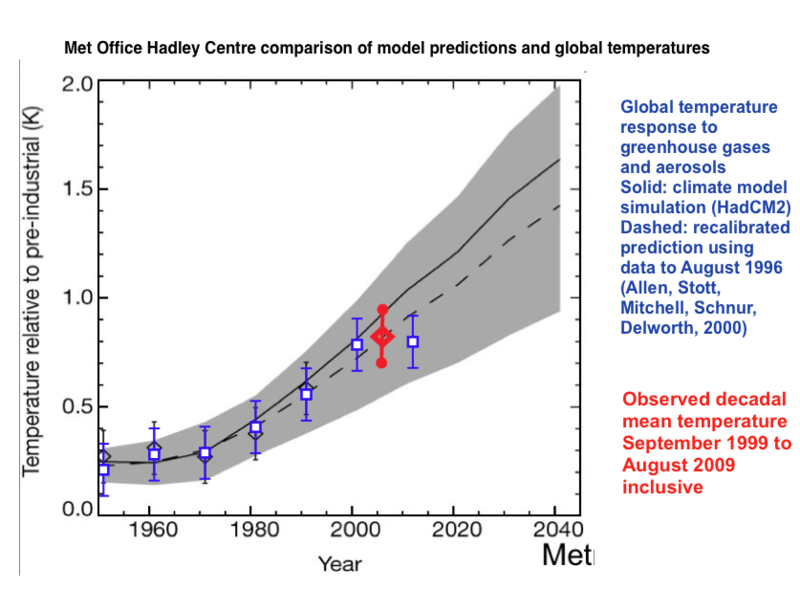 The climate models did not start making their predictions of global waring in 1960. In those days they were predicting global cooling. So I’m not sure what they are trying to prove with this graph. How can the error of the simulation be greater in 1990 than in 1960 if the simulation was done in 1990? Your point about the date when the climate model was run is of course true. I suspect the first model runs are from around 2000 and were adjusted to fit the existing data. So the real test is to match future data and in this it failed because the model was then re-calibrated. I guess they would argue that the error bars represent their uncertainty about parameter values of the model. Nowadays they talk of an ensemble of models – and then the spread of predictions represent the “error”. Of course all the models may have built in systematic errors which are ignored.